The book is split into four parts. The first part provides an overview of the technology, the basic concepts that guided the development of Bluetooth low energy, the architecture of the system from the radio through the various protocol layers up to the application layers, and finally the new usage models that this new technology enables. The second part goes into detail on how the radio chip, called a controller, works. This is the silicon chip that a product designer needs to incorporate into their end products. This part covers the radio, direct test mode, and the link layer. It also shows how to interact with the controller from the upper layer stack, called a host. The third part goes into detail of how the host, the software stack, works. It covers the concepts and details behind the main protocol used to expose attributes of a device. It also covers the security models and how to make connections and bond, or associate, two devices with each other. The final part describes how an application can use Bluetooth low energy to interact with peripherals, explains how a peripheral can be designed to make the best use of the low energy technology, and explains how to test and qualify a design so that it can be sold or distributed. Robin Heydon was educated as a software engineer, graduating with a degree in computer science from the University of Manchester, UK. He worked in the computer entertainment industry for a decade working on networked flight simulators. He then moved into wireless communications in 2000, working for what was then a small company called CSR. There he moved from a firmware engineer to a full time standards architect. In this work, Robin has worked on fixing and improving all versions of the Bluetoothspecification. 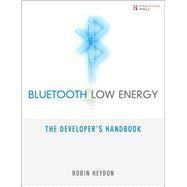 In early 2007, Robin started working on a project called Wibree, that later became the Bluetoothlow energy specification. He co-chaired the group, and drove through the specification to publication, being recognized by the Bluetooth SIG as an inductee to the BluetoothSIG Hall of Fame in 2010. 13.4 What does this device do?